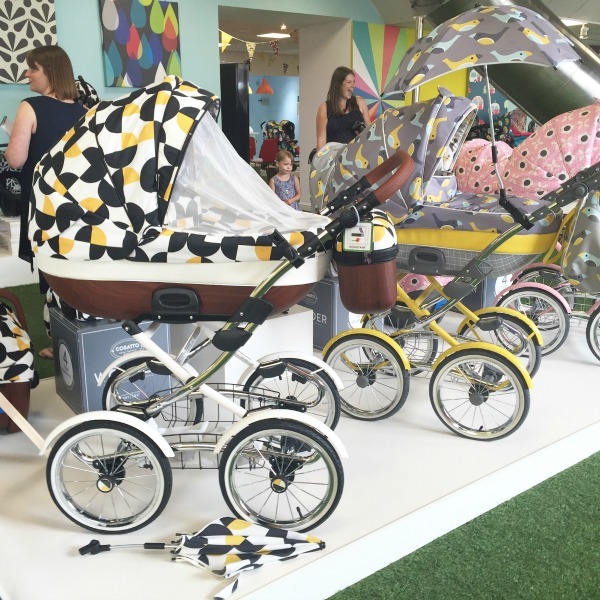 Recently, Joseph and myself visited Cosatto HQ for their annual press day where we got to see all the new range of pushchairs, prams and car seats and all the wonderfully new patterns that they have brought out for this season. If you're a regular reader, you will know just how much we love Cosatto. Overall, over the years, I have pushed the Yo!, the Ooba, the Supa and we are currently using the Fly, Joseph even has one of their Story cotbeds too. So getting to pop in and see all the brand new patterns and fawn over the new designs was amazing. 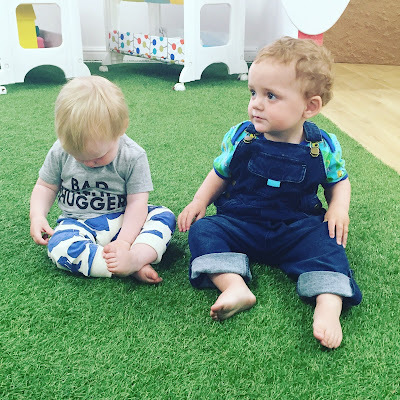 Plus it gave Joseph a chance to have a play with some toddlers his age as a couple other bloggers had also brought their sprogs along. On the way there, we met Hannah and H-Bear from Make Do and Push at the train station and continued the journey to Cosatto HQ together, all sweltering in the heat that we were currently experiencing. We may have arrived a little late since the taxi driver took us to the wrong place initially. Who knew some cities have 2 streets with the same name?! Upon arrival, Joseph had fallen asleep so it gave me a chance to listen in to the presentation, all about how the designs are come up and the Cosatto ethos. This season is called 'A Festival of Pattern' and when you see the designs, you can see why. 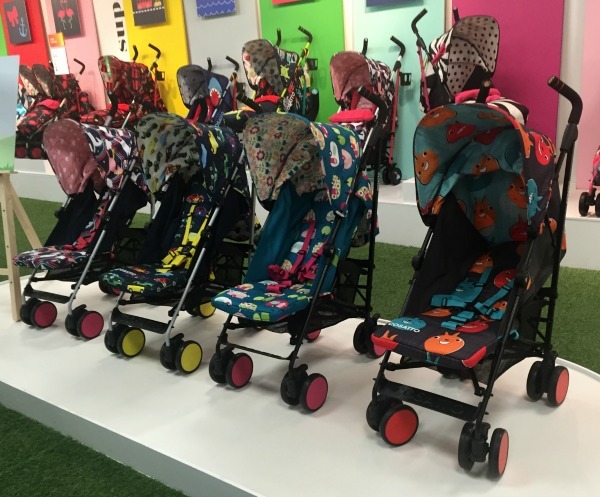 Bright, bold and beautiful, the whole showroom is kitted out in Cosatto's signature brightness, with all the pushchairs and car seats on display. It's like a huge play area for buggy obsessed mums. And so we got to jaunting around the huge room, exploring all the pretty designs and trying to find our favourite of the lot, which is very hard to do when all the designs are so wonderful! 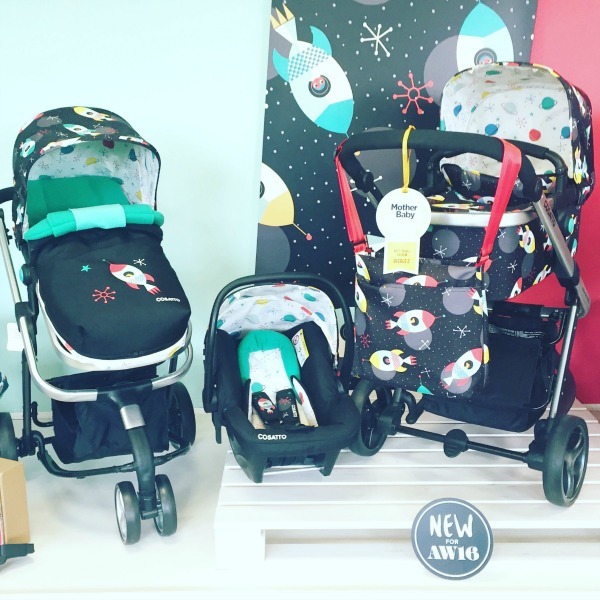 The Cosatto Giggle 2 hosts a whole new range of patterns. Happy Campers is a beautiful colour and design, with bright pink accent colours in the frame just to work it all together. My favourite design on this pushchair has to be the Space Racer though. I think the black and green work together perfectly and the little rockets are so fun and funky. 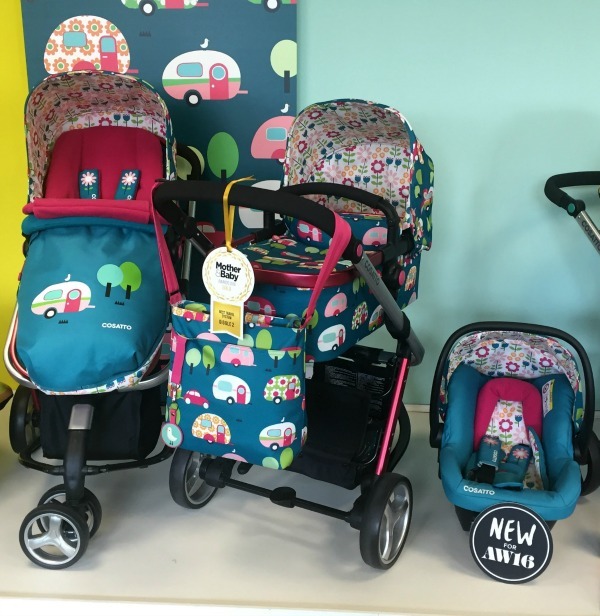 The brand new to market, Cosatto Supa Go is ideal for someone with a toddler like myself. If you're wanting a pushchair that is perfect for travelling with, small and compact, then this is your pick. It comes in four brand new designs, Happy Camper, Magic Unicorns, Rev Up, and the ever so delightful Hoppit. 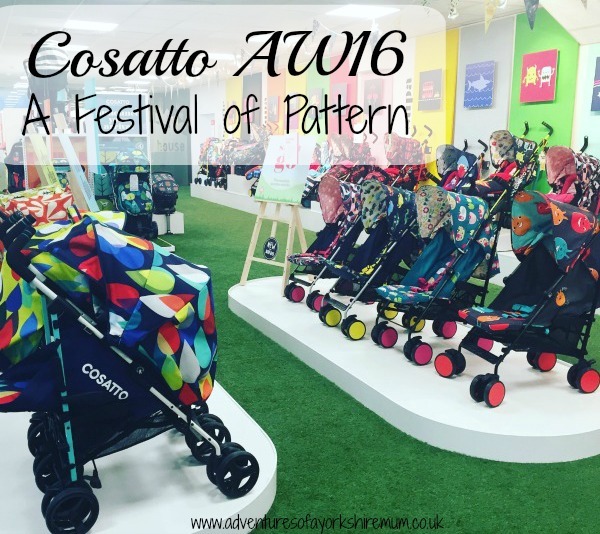 It was finally the day I got to see the Cosatto Wonder travel system up, close and personal. I mean, just look how stunning it is. The 3 designs just stand out and ooze quality and wonderful design. With only 500 made of each design, the Wonder truly is limited edition. 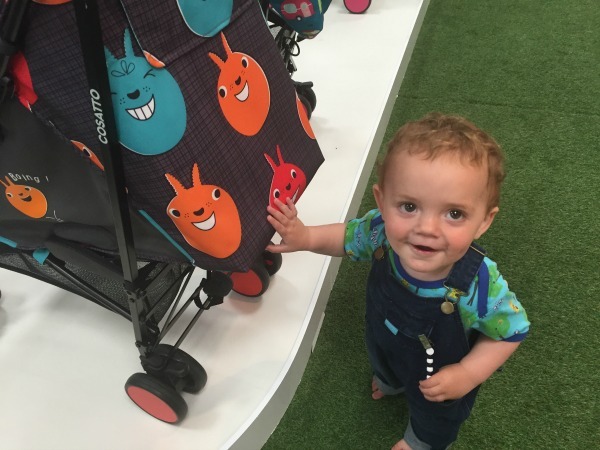 After having a look around, Joseph finally settled on his favourite, the Supa Go in the Hoppit design. With a hop in his step and a smile on his face, he kept coming back to this pushchair and giggling at it, I think the hoppers are his thing! It's not often that you get to go into a big HQ and ask them anything, so whilst there I thought it best to ask for some advice re. the Cosatto Fly that we have. You see, the Cosatto Fly boasts being a one-hand fold, and although I had tried many times, I couldn't get it to fold without a few choice words coming its way. It took a bit of trying, and a few attempts, but eventually Pippa from Red Rose Mummy came to the rescue and worked out how to do it effortlessly, simply by putting the brake on before attempting to put it down... Simples! And then it was time to pack our pushchairs and kids up, and head off home to dream about flowers, and unicorns, and hoppers, or I'm sure that's what Joseph was doing any way! 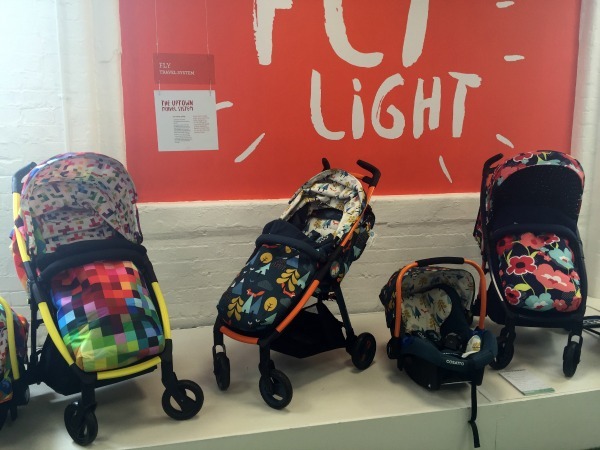 We're out of the push chair stage, but these buggies are gorgeous. I love the colours and the patterns they are so full of character and life. I wish I had something like this when I was pushing my buggy round Tooting. All I had was a boring black McLaren. I reckon the Paris mamas' would love these! 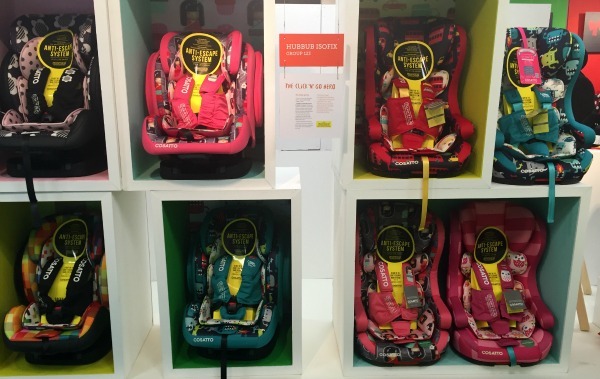 Love the fab colours, I don't remember having nearly so many options when my kids were little. Sounds like they were really helpful too, I could never put a pushchair down one handed! I love how colourful the push chairs are. I wish mine was as colourful. Hardly anything in pink. Wonderful! Love the bright and dark colours.